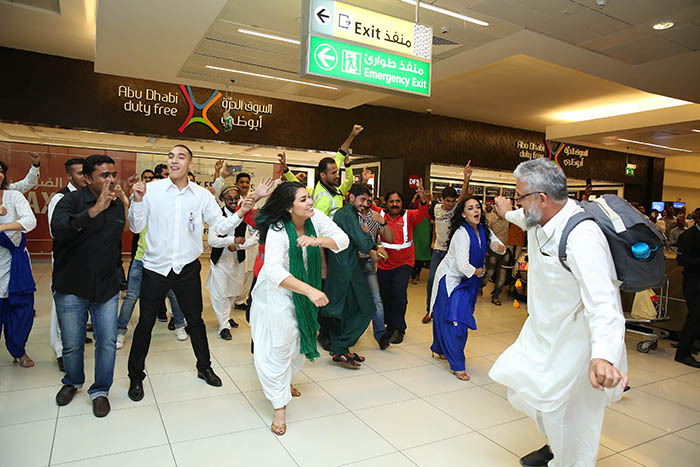 AEROBD.NEWS : Passengers travelling to or coming from Pakistan or India this week were treated to a terminal-wide festivities at Abu Dhabi International Airport, marking the Pakistan Independence Day on the 14th August, and the India Independence Day on 15th August. The celebrations included a flash mob that surprised passengers arriving from various destinations in both countries, as it suddenly appeared in the baggage claim halls, leaving the arrivals in total amazement. Passengers had also the opportunity to take photos in front of the famous “Wagah Border”, which is a tradition that reflects the close relations between the two communities. Both Terminal 1 and 3 were carrying the flags and colors of both countries in a tribute to those nations. Abu Dhabi Duty Free and several of its concessionaires also joined in with many offers and discounts over the two days, including Sharaf DG, Pure Gold, and the airport’ lounges operated by Plaza Premium. In addition, the VIP Terminal chose 50 lucky passengers and gave them the opportunity to experiment the luxury travel experience they have on offer.